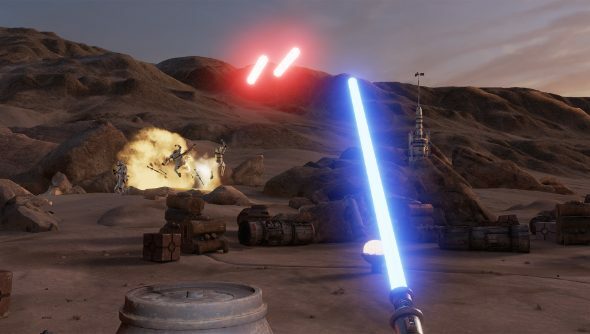 HTC, Valve and Lucasfilm are putting Vive owners in the shoes of a Jedi padawan with a free Star Wars VR game, Trials of Tatooine, available from Monday. If you’re looking for other games to justify that Vive, here are the best VR games on PC. The game, co-written by Lucasfilm CTO Rob Bredow and keeper of the Star Wars canon Pablo Hidalgo, puts you into a galaxy far, far away just after Luke Skywalker has defeated the Emperor and is looking to rebuild the Jedi Order. As one of the hopeful padawans, you travel to Tatooine, end up on the Millennium Falcon and are gifted a lightsaber by a familiar astromech droid. Using the Vive’s remote you can wield said lightsaber to reflect blaster shots, which obviously comes in handy at some point in the VR cinematic experience. Trials of Tatooine has been available all weekend at Star Wars Celebration in London’s ExCel centre, where Industrial Light and Magic are showing off all manner of neat toys. Nice of them to let everyone who couldn’t afford the plane tickets and entry because they spent $700 on a Vive play as well.